← Why You Need A Complete Rethink. Part 1 – The best assessment of Investment Management is not Returns. In Part 1 I formulated a clear metric for analyzing investment returns – Repeatable Volatility Adjusted Returns (RVAR). In part 2 I take a look at allocation strategies. Now that we know what metric to look for the job of assessing asset strategy should be a lot easier. The first stage for assessing any strategy is understanding why the approach being adopted will provide a clear edge in delivering RVAR. If the strategy can not articulate why it has an edge then, simply, it does not have one! Tragically the investment management business commonly adopts a Stock/Bond Passive Allocation Strategy. I will start by demonstrating that this approach is just nonsense! Three simple points show this is the case, with potentially devastating consequences for investors with this allocation. 3. This is now the worst time in history to adopt a 60% equity/40% bond passive allocation strategy. 1. The Stock/Bond allocation strategy is based on the concept of a consistent negative correlation between the price performance of stocks and bonds. When one goes up the other goes down. However, this is historical nonsense! 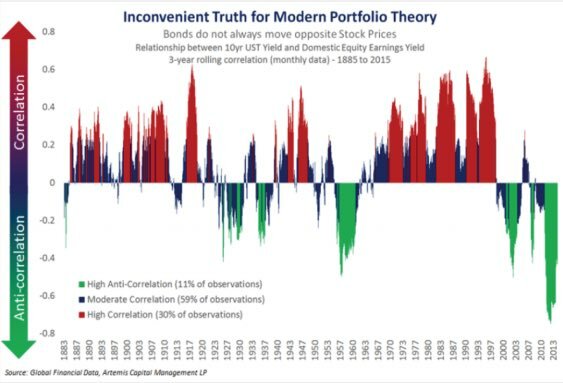 The chart below shows that over the last 130 years the correlation between stocks and bonds is only clearly negative 11% of the time! So there is simply no clear historical basis for the stock/bond allocation strategy. 2. The only certainty about investment conditions is that at any time growth and inflation are either going up, down or sideways. Whatever, investment conditions currently are, therefore, they can be described by movement in the 4 quadrants shown below. Formed by the direction of inflation and growth. 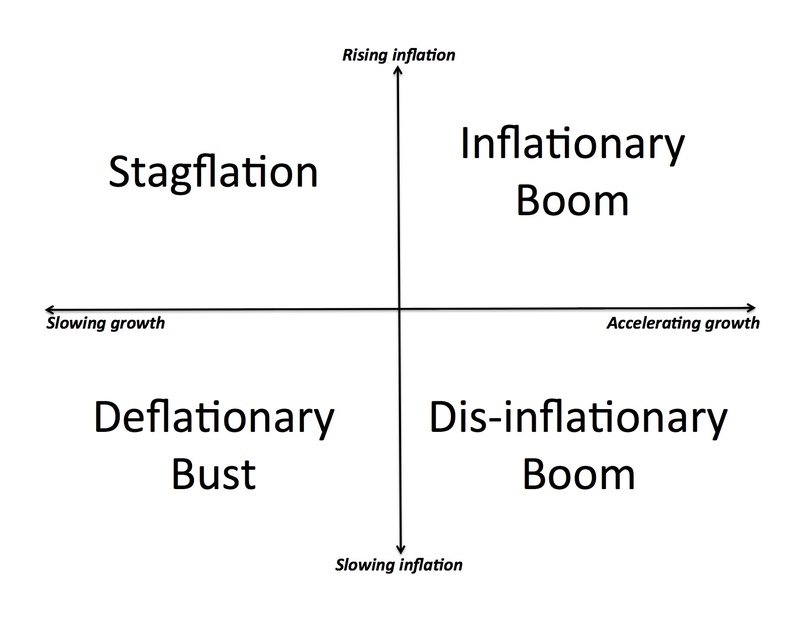 The top left quadrant, which is essentially one of just 4 conditions is Stagflation. Clearly this is hostile to both stocks and bonds! This environment was in place for most of the 1970s! So in one of just four conditions a stock and bond allocation would be disastrous and has proved to be so in the past! Indeed, a static allocation to bonds, in general, seems to be an absurd idea given that rising inflation is likely around 50% of the time and policy is even targeting 2% inflation as a norm! So, I believe we can conclude that the theoretical basis for a stock/bond passive allocation strategy is nonsense! 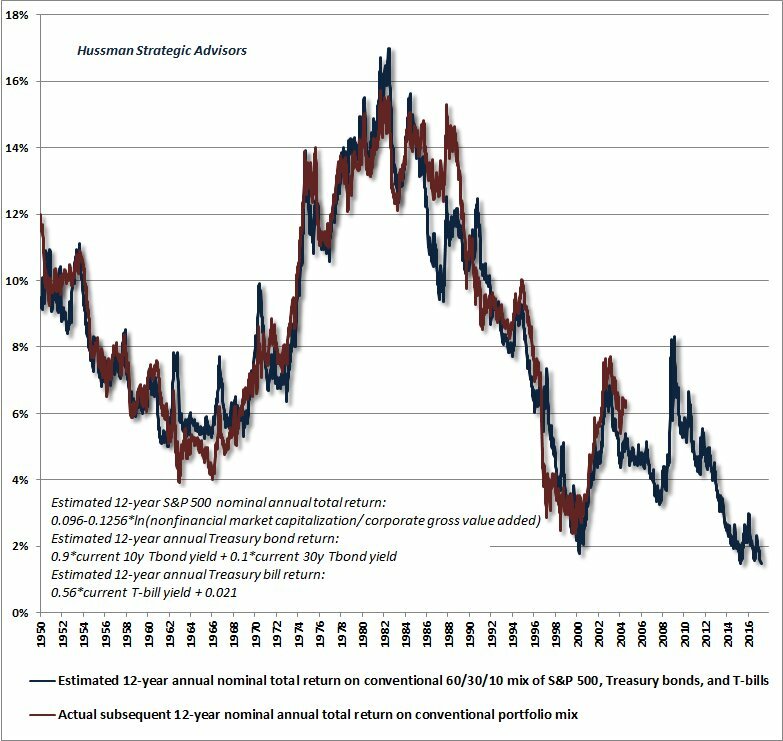 The chart below shows that currently a 60% equity/40% bond passive allocation strategy now offers a nominal return over the next 12 years of less than 2%! Allowing for taxes and inflation the expected return is likely below zero! In terms of RVAR, there are much better passive allocation models. The Permanent Portfolio and the All Weather Bridgewater Fund have an edge because they have been selected to balance performance throughout the rotation of the economy over the 4 quadrant model above. 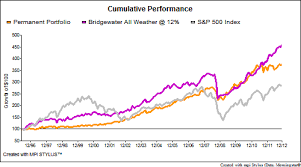 Over 45 years, as shown on my web site, both the Permanent Portfolio and the Bridgewater All Weather have generated both far lower volatility, AND higher volatility adjusted returns, with very little difference in very long term overall returns. The chart below shows that both the Permanent Portfolio and the Bridgewater All Weather out performed the S&P 500 over the 16 years period through the last 2 bubble periods, with lower volatility. So here is a very simple improvement for investors with a one click purchase order. 45 years of data suggests there is a much more balanced allocation could be easily available. Yet the great majority of investors seem to have never even heard of either Bridgewater (currently the world’s biggest hedge fund), or the permanent portfolio. In Part 4 I will show what I believe is the path to further improvements to RVAR through making a shift to Active Asset Management with tactical allocation models.